Berwick gave their fans a day to remember as they came from behind to beat ten man league leaders Forfar at Shielfield on Saturday. Rangers led 1-0 through Darren Lavery, but found themselves 2-1 down at half-time. An own goal from Jamie Bain got them back on level terms, just minutes after Danny Denholm was sent off for the visitors for a second bookable offence. Gary Phillips then popped up to net the winner in the 88th minute, just a minute before Rangers went down to 10 men themselves after a trialist was sent off after receiving a straight red card for a foul. Berwick gave debuts to two players, Dutchman Renne Donkor, who was signed in January, and midfielder Sean McKirdy, who joined from Hamilton in midweek until the end of the season. The first real chance of the game came after seven minutes when Forfar were awarded a free-kick and Denholm pounced on a headed clearance and drove in a shot which was smothered by Devlin Mackay. 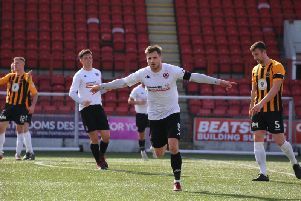 But it was Berwick who made the breakthrough when Lavery broke through the middle and his shot from 20 yards out found a way past Grant Adam in the bottom corner. Just a minute later, Michael McKenna forced Adam into a good save to deny him with a shot from the right which he palmed away. But, on 13 minutes, Forfar equalised when David Cox got the better of Donkor in the box and he turned and shot past Mackay from 15 yards out. In 21 minutes ,Forfar took the lead when Denholm did well on the right and cut the ball back for Peters to score with a first=time shot from just outside the six yards out. On 27 minutes, Steven Thomson had a free-kick which just dipped over the crossbar and as Berwick tried to force their way back into it, Arron Murrell had a shot blocked before McKenna fired over from the rebound. For the second half, Donkor was replaced by Greg Rutherford as Berwick went two up top and the striker breathed fresh life into the home attack. But play was fractious, with several stoppages and in 68 minutes Forfar were reduced to 10 men when Denholm was sent off for a second bookable offence. In 71 minutes Rangers managed to haul themselves level when McKenna played Rutherford in down the right and when he crossed the ball across the face of the goal, fullback Jamie Bain turned the ball into his own net. Berwick then sealed it in 88 minutes when Phillips netted the winner with a shot after the ball was played into the box from the right. A minute later the Berwick trialist saw red, but Rangers managed to hold out for a big three points which lifted them up to sixth place in the table. Berwick: Mackay 6, Hamilton 7, Phillips 6, Donkor 5 (Rutherford 46) 7, Scullion 8, Spark 6, Thomson 7, Lavery 7, McKirdy 6 (McKinlay 75), McKenna 8, Murrell 6 (Trialist 72).